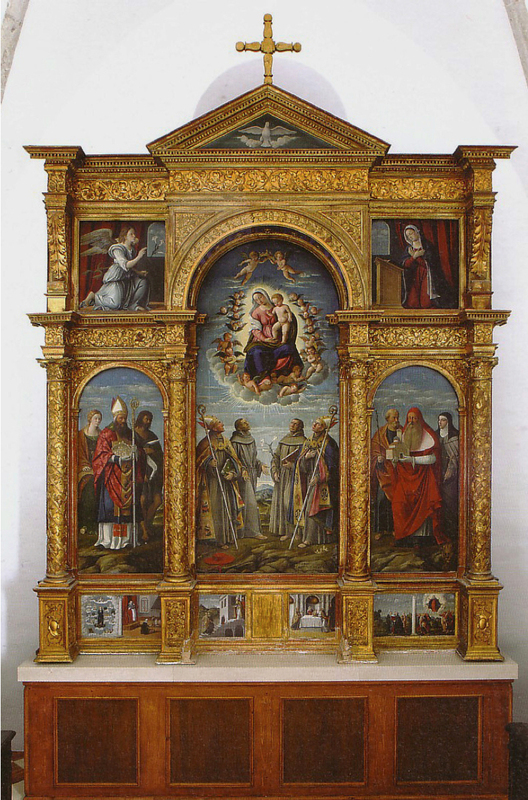 Dr. Kiril Penušliski examines the creation of this exceptionally well-preserved early 16th century Venetian altarpiece which survives on the island of Košljun, off Krk. Girolamo da Santacroce, polyptych, The Virgin & Child in Glory with Saints, painted for the Franciscan Convent Assumption of the Virgin, Krk, 1535. Now Church of the Annunciation, Košljun, near Krk. When Catherina Fusculo passed away in Venice at the beginning of 1520, she left 1000 golden ducats to the Franciscan convent on the island of Krk in Croatia [i]. 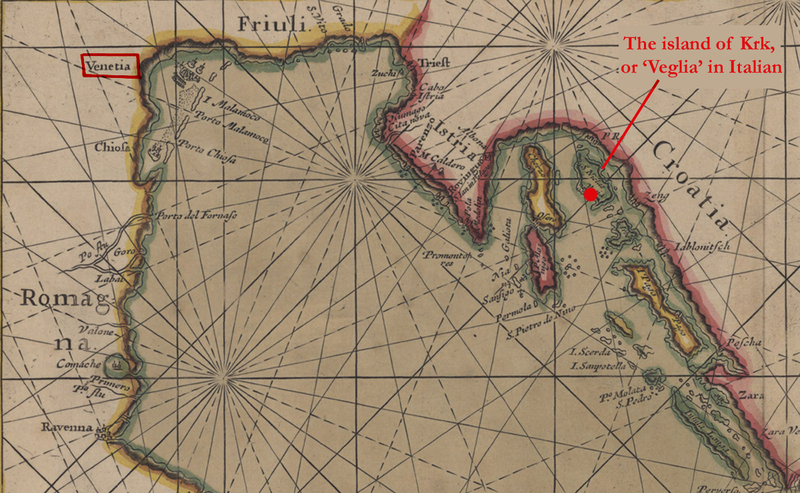 Born Frankopan, Catherina was the daughter of the last count of the island, Ivan Frankopan, who ruled independently before Venice incorporated the island into its own colonial empire [ii]. 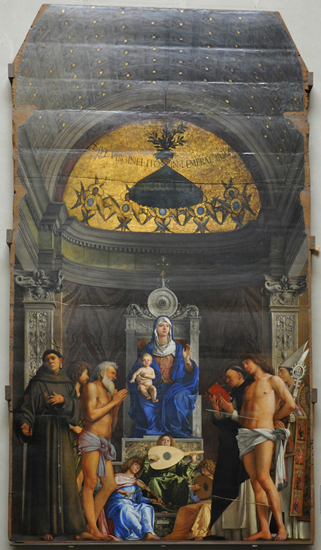 After overcoming some legal issues[iii], the Franciscan friars received the money Catherina bequeathed, and on the 4th of August 1535 commissioned an altarpiece for their church [iv]. Eight months later, it was finished. 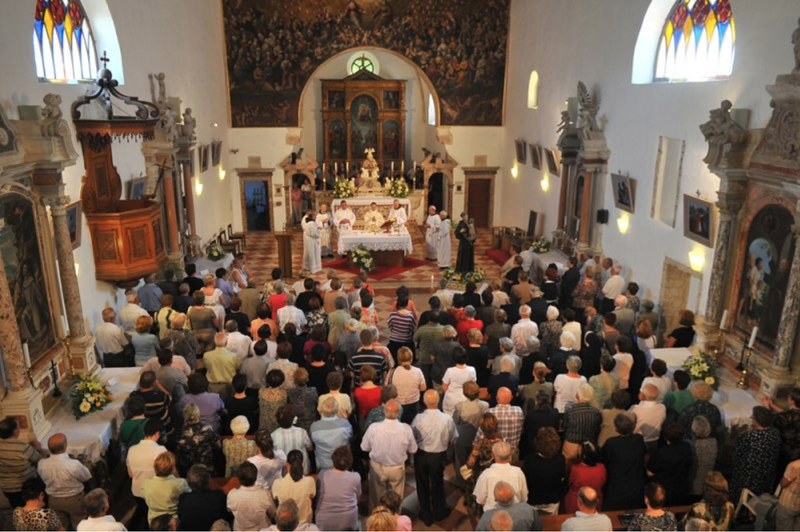 Today the painting is in the church of the Annunciation on the tiny island of Košljun, near the town of Krk. The painting is a work by Girolamo da Santacroce. Born in Bergamo around 1480/85, he was probably first a pupil of Gentile Bellini, before moving to the studio of the younger Giovanni Bellini. Girolamo become an independent master around 1517, but he was not a particularly original artist. Very often he relied on the art of the Bellini brothers, and his paintings seem unaffected by the accomplishments of the subsequent generation of painters (in effect his own generation, that of Giorgione, Titian, Sebastiano, Lotto and Veronese). It is difficult to believe that Girolamo was unable to accept or take into account the changes happening in Venetian art at the time. Rather, it seems that his continual use of the landscapes, light, typology of figures and the general compositional examples invented and promulgated by Giovanni Bellini, was a conscious choice and that he specifically adapted his production toward clients who had a more conventional taste in pictures, such as the Franciscan friars who commissioned the Košljun picture. 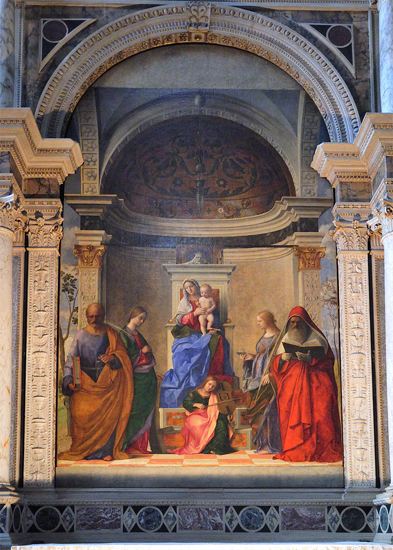 (3) the majestic San Zaccaria altarpiece from 1505, still in situ in the church of San Zaccaria in Venice [vi]. Although it was not uncommon for a painter to carve and on occasion to gild [viii] the frame for the picture he was to produce, this time a separate carver and a gilder were commissioned. As per the preserved contract, the commissioned artists were the carpenter Bartheo Andrea, the carver Sebastian Jacob and the gilder Francesco Bragadin. They were to construct the polyptych’s frame according to a previously agreed contract drawing which unfortunately has not survived. However, there are a number of other contract drawings by Girolamo that give us an indication as to how the contract drawing might have looked. 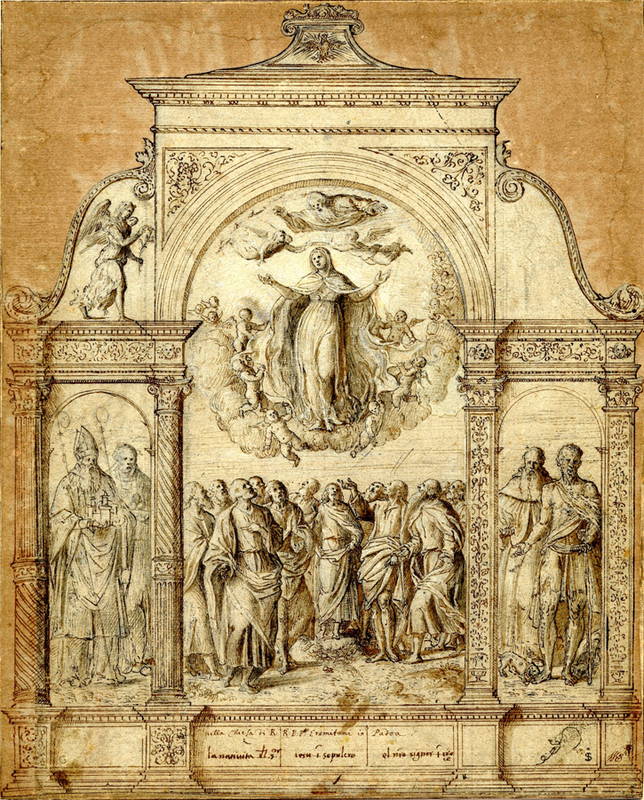 Signed by a notary on 12th of June 1526, the Design for an Altarpiece in the Rijksmuseum shows the disposition of the figures in a polyptych. Only the left side of the polyptych is sketched out in detail, as the floral decorations of the frame would be repeated on the right-hand side. To the left and below the frame, there are divisions of scale which indicate that the drawing was intended to be used as a guide for the woodcutter commissioned to construct the frame. A similar example is in the British Museum in London. It currently carries an attribution to Benedetto Diana, but the typology of the figures and the author’s intimate knowledge of Titian’s Assumption of the Virgin confirm that a more likely candidate is Girolamo da Santacroce [ix]. 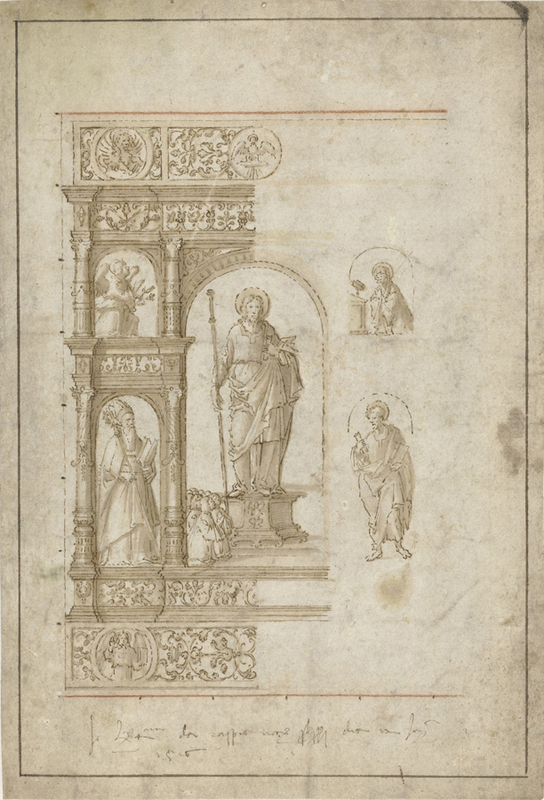 Although the drawing lacks any indication of scale or measurements for the individual panels, it must have been used as a model to show the patron a number of possible styles of decoration for the frame; the artist having sketched out three different solutions. The left section of the polyptych has two columns with different classical decorations (the first is fluted while the second has vine ornaments), whereas the right has pilasters with floral decorations. The Košljun polyptych does not exactly conform to either of these two drawings, with both the disposition of the principal panels and the decorations of the frame varying slightly. At the bottom, it starts with four column bases that have six predella panels between them. The bases support two pairs of columns (with Corinthian capitals) decorated with a floral, vine and grape design. On the two columns on the left, the decorations wind up the columns clockwise, while on the two columns on the right the vines go up counter-clockwise. Each column pair is carrying an entablature linked by a broken segmental pediment. The two upper panels forming the scene of the Annunciation are flanked (on the outside) by corbels decorated with large leaves, while the deep cornice mouldings in the upper section of the frame are derived from a canopy as seen in antique aediculae. The whole frame is embellished with the same floral vine ornaments/design, save for the two outboard bases of the columns that have oval cartouches where most likely the crest of the donor would have been placed. 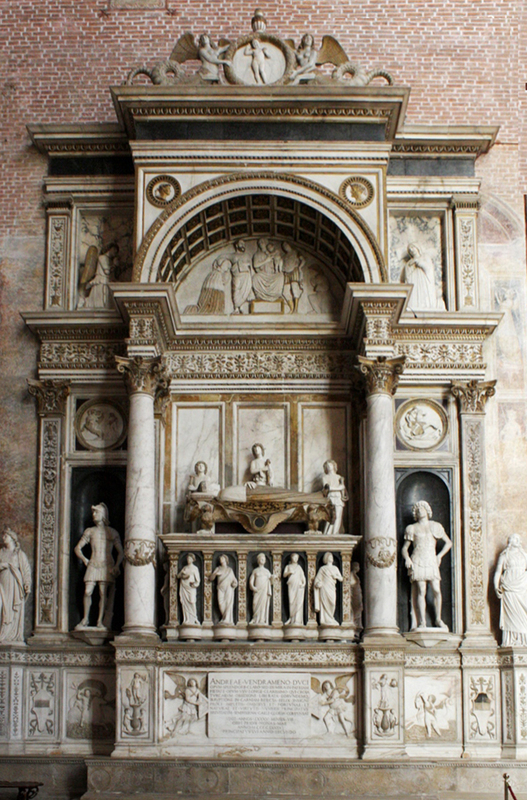 This polyptych format appears often in the Santacroce catalogue; its general disposition, form and decoration all being inspired by classical architecture. But in general terms, most late fifteenth and early sixteenth century Italian altarpieces were designed with architectural motifs so they could reflect contemporary church architecture; this added to the sense of majesty and authority carried by the sacred scenes the frame protected. 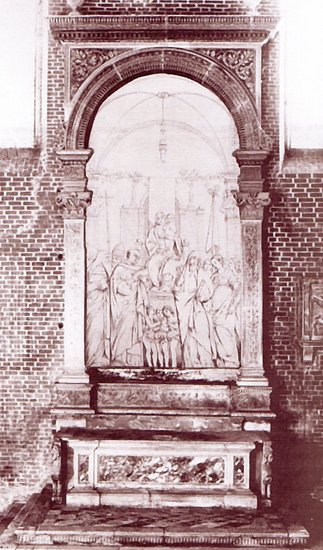 The form of Košljun altarpiece, with its three axis, triumphal arch design ‘broken up’ by four pillars in three uneven parts, began appearing in Venetian art in the later part of the fifteenth century. The type was highly influenced by the form of several funeral monuments created by the Lombardo family of sculptors[x], notably the two sons of Pietro Lombardo, Antonio and Tullio, who constructed a number of highly important funeral monuments for various Venetian doges. 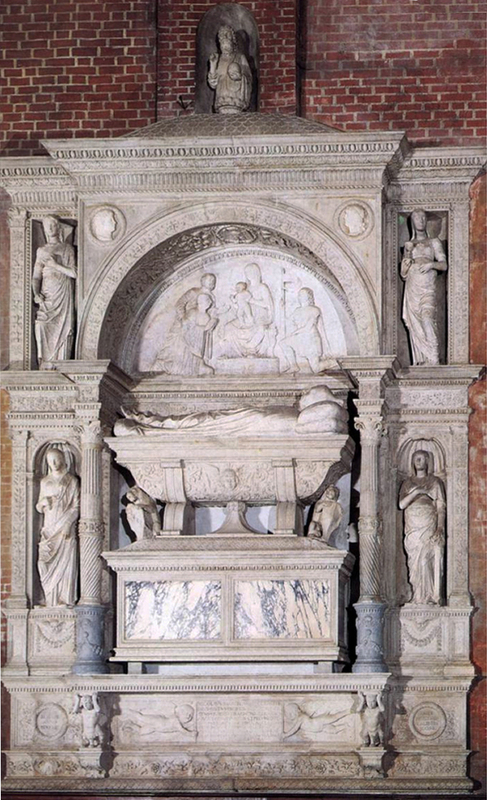 The most significant are the monuments for Doge Niccolò Marcello (1474) and that for Doge Andrea Vendramin (1480-94). Girolamo da Santacroce’s Košljun polyptych is one of the largest preserved works by this artist (the frame is 523 x 410 cm), and the contract document clearly shows that it was an expensive commission. The price was 174 gold ducats, which, when compared with prices given by Peter Humfrey for paintings done by Titian at roughly the same time (for the Averoldi polyptych of 1520-22, Titian was paid 200 ducats; and for the Death of St Peter Martyr from 1526-30, 100 ducats [xi]), places it in the upper part of the price range for Venetian paintings in the early part of the sixteenth century. 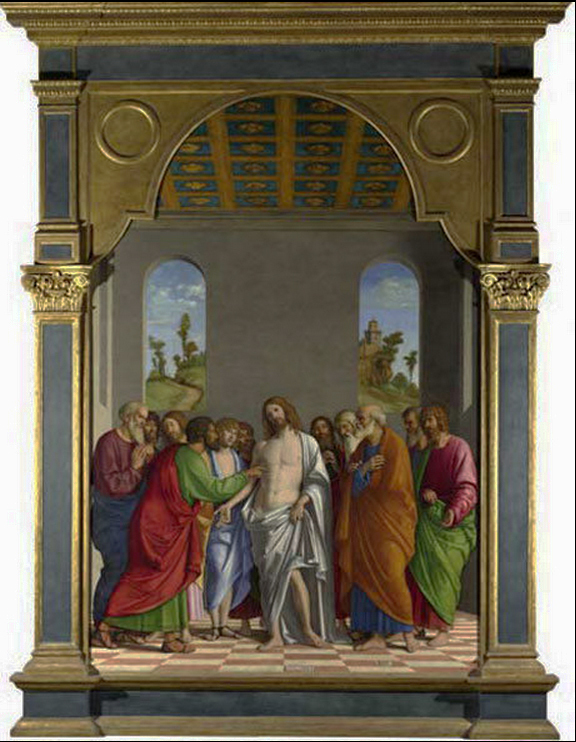 This high price also indicates that the patrons of the Košljun picture were not influenced by financial matters, and that taste and stylistic preference were the primary reasons why Girolamo da Santacroce (together with the rest of the artists mentioned in the document) was commissioned. From the document we can also follow the division of finances between the artists. The carpenter received 36, the gilder 57, the carver 25 and the painter 56 ducats [xii]. This shows that the painter received about a third of the sum paid for the finished piece, with the other two-thirds going toward the construction of the frame. Most altarpieces produced during the renaissance were executed in the painter’s studio. When they were finished, they had to be transported from the studio to the churches for which they were designed, and then erected and secured on their altars. Very few contracts detail the arrangements between the painter and the patron for the delivery and installation (unfortunately this is also the case for the Košljun piece). Much more common was the simple guarantee of the artist that the execution of the piece was going to be of the highest standard and that the artist would repair any damage which the painting might sustain in the span of the next few years. However, Anabel Thomas’s analysis of Neri di Bicci’s ricordanze shows that he was frequently required both to deliver and to set up his finished product. The fact that the record occurs much more often in Neri’s books than it does in preserved painters’ contracts, suggests that painters undertook this responsibility as a matter of course and that most parties did not see any need to record the requirements in a contract [xiii]. Altarpieces were generally painted in the same towns for which they were commissioned, so transport was probably undertaken by workshop assistants who were used to handling art objects (be they gilded paintings or carved wooden statues). For longer journeys most of the paintings had to be meticulously prepared for transport. Most probably, straw and canvas were used as packaging materials. There is a recorded instance when a special crate was constructed to transport an altarpiece: this was for the transportation of Cima de Conegliano’s painting of The Incredulity of St Thomas to Portogruaro [xiv], when the painting travelled by both water and land. Altarpieces that had to travel many kilometres may have been put under the care of a company that specialized in shipping and carting large unwieldy objects [xv]. But the transportation of the majority of Venetian works destined for Adriatic customers probably did not involve the artist travelling any further than the quayside of his local canal. After the initial contact between the patron (or his representative) and the artist was made, business could be conducted at long range and the completed work dispatched to its destination on a merchant vessel [xvi]. In our case, we know that three high ranking members of the Franciscan order made the trip to Venice, where they signed the commissioning document in person. These three were the guardian of the Košljun convent, Francesco Subich de Vegia, the procurator of the convent, Stephano Trivisan, and the procurator of the Franciscan province of St Jerome in Dalmatia, Alvise de Renier. However, nothing is known about the actual transfer of the piece to Dalmatia. Although transportation of paintings from Venice is rarely mentioned in documents, I cannot escape the feeling that the continuing taste among customers along the Dalmatian coast for the polyptych format, all but extinct in Venice itself by about 1500, can somehow be linked to the practical considerations of transport. Polyptychs, by their very nature, were constructed of pieces that were fitted together and could thus easily be disassembled for ease of transport. Having the large format of the Košljun piece in mind, this was most probably how it was transferred from Venice to Krk, in sections which were then assembled on site with the help of a local carpenter, woodcutter or another skilful craftsman. 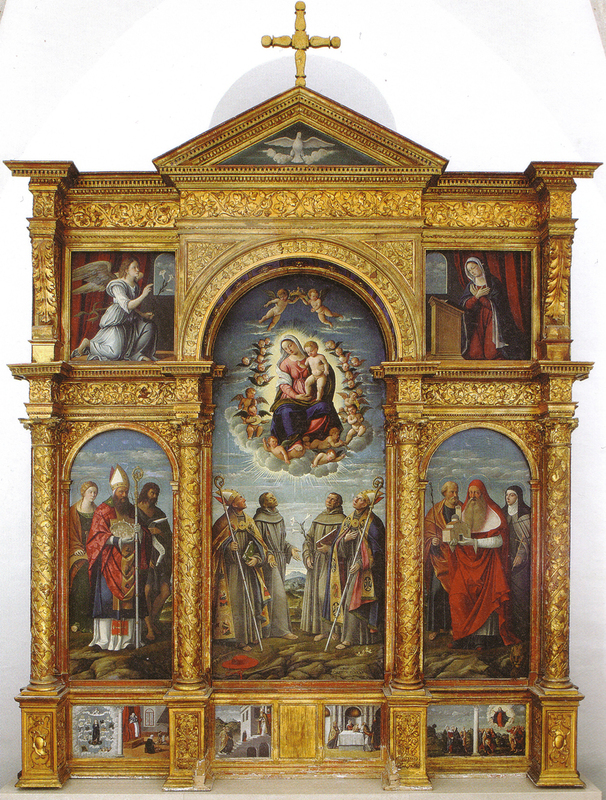 Still in excellent condition, the Košljun polyptych is an outstanding example of Santacroce’s talent and ability as a painter. At the same time it is also an impressive example of early sixteenth century Venetian altarpiece and its frame ranks among the best preserved pieces from that period. A Macedonian art historian who used to have tempestuous hair, Dr Kiril Penušliski is an expert on Italian Renaissance art. Despite having received his PhD degree in Jedi Sciences (read Art History), he can still on most nights be found playing chess online. His most lofty goal and ambition in life is to someday learn how to avoid making mouse slips in bullet games. [i] Catherina’s original testament is lost; but sections of her will are preserved in the archive of the Franciscan convent on Košljun; documents from 1520 – Processo del legato di Cattarina Frangipani. 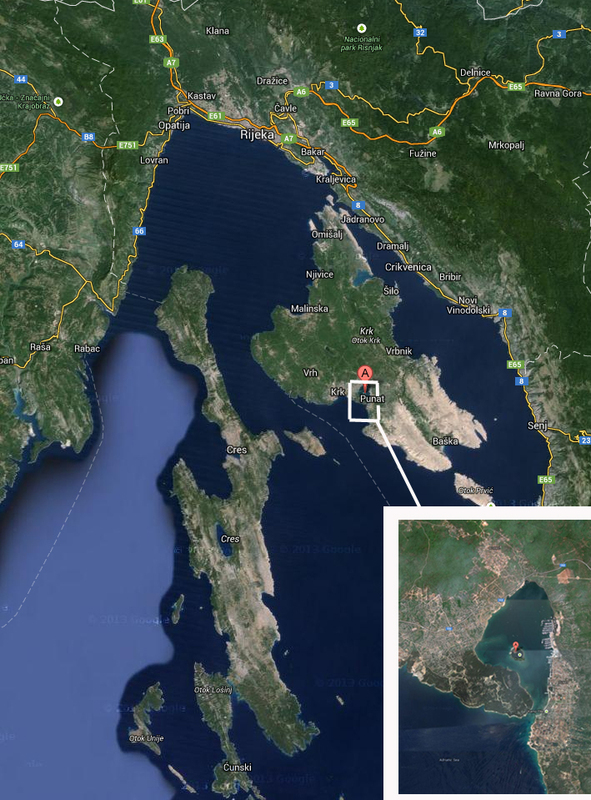 [ii] For more on the circumstances in which Venice took control of the island and the subsequent fate of the last count of Krk see Vladislav Brusić, ‘Crkva sv. Marije od Navještenja na Košljunu’, in Bogoslovska smotra, vol. 21, n. 4. 1934, pp. 273-282. [iii] There was some dispute between the heirs of the estate of Catherina’s first husband, Francisco Dandolo, the Franciscans from the island, and some other relatives of Catherina. The dispute was settled favourably for the Franciscans after they produced a number of witnesses who testified in their favour. See Brusić, ibid., pp. 276-280. [iv] Fortunately, the commissioning document has survived. The most recent publication of the text can be found in Tizian, Tintoretto, Veronese, Veliki majstori renesanse, exh. cat., Galerija Klovičevi dvori, Zagreb, 2012, pp. 182-183. [v] Still the best source for the Belliniani are the three volumes by Fritz Heinemann (Giovanni Bellini e i Belliniani, Saggi e studi di storia dell’arte, vol. i-ii, Venice, 1962, and Giovanni Bellini e i Belliniani: Supplemento e Ampliamenti, Hildesheim, Zurich and New York, 1991). [vi] For more on these paintings see Oscar Batschmann, Giovanni Bellini, Reaktion Books, 2008. [vii] For more on the iconographic program of the piece see Ivana Čapeta, ‘L’iconografia della Madonna nel politico di Girolamo da Santa Croce nella chiesa francescana sull’isola di Košunj’, in IKON, Journal of Iconographic Studies, n. 3, 2010, pp. 311 – 317. [viii] One such famous example involves Leonardo da Vinci and the frame for his Virgin of the Rocks, now at the Musée du Louvre, Paris. [ix] For more on the drawing see the Museum’s website. Writing in 1999, Bernard Aikema expressed his dissatisfaction with the attribution to Diana (see ‘Design for an Altarpiece’, in Renaissance Venice and the North, eds. Bernard Aikema and Beverly Louise Brown, Rizzoli, New York, 1993, p. 354). More recently the drawing has been given to Girolamo, as in Tizian, Tintoretto, Veronese, op. cit., p. 181. [x] For more on the family see Alison Luchs, Tullio Lombardo and Venetian High Renaissance Sculpture, National Gallery of Art, Washington, Yale University Press, 2009. [xi] Peter Humfrey, The Altarpiece in Renaissance Venice, Yale University Press, 1993, p. 154. [xii] As the Franciscans monks were very pleased with the painting they received, they awarded each of the artisans an additional sum on top of the previously agreed payment. [xiii] See chapter ‘Completion of Merchandise: Delivery’, in Anabel Thomas, The Painter’s Practice in Renaissance Tuscany, Cambridge University Press, 1995, especially pp. 198-200. [xiv] See Peter Humfrey, Cima de Conegliano, Cambridge, 1983, p. 203, and also The Altarpiece in Renaissance Venice, op. cit., p. 157. [xv] On transporting large objects long distances throughout Europe see P. Spufford, Power and Profit: The Merchant in Medieval Europe, London, 2002, pp. 192-203, and C. Cipolla, ‘In tema di transporti medievali’, in Bolletino storico Pavese, V, 1944. pp. 3-36. [xvi] Peter Humfrey, ‘Demand From Abroad’, in Venice and the Veneto, Cambridge University Press, 2008, pp. 331-332. With thanks from The Frame Blog to those who have generously allowed their images to be used here. Just come across your artistic history blog, loving the effort you put in thanks! Your blog has been a true delight! I understand that you specialize research on antique & frames, but do you also cover frames on more “contemporary” pieces? I hope to hear from you soon! Thank you! One of the articles on The Frame Blog deals with George Bellows, who was working in the first quarter of the 20th century [ https://theframeblog.wordpress.com/2013/06/15/framing-george-bellows-ashcan-artist/ ], and I’m quite interested in other 20th century artists’ frames where they display some sense of design, innovation or particular attention to complementing the painting; but I can’t say that contemporary frames are (generally) very imaginative or exciting.